We’ve gathered the materials from our annual partner dinner, which was held on June 14th, 2014. We’d like to share some images from the event plus the theme for which inspired us to connect with our community. You’re encouraged to comment and share your feedback. The event was a little over 2 and half hours. We opened the dinner with a welcoming session which included everyone getting seated and getting to know others at their table followed by an opening prayer and song then we blessed the food before partaking. It was an enjoyable dinner with fresh caught lobster and for those that did not prefer seafood, they were served chicken to 75 partners and friends. If you were in attendance – thank you for being there with us! 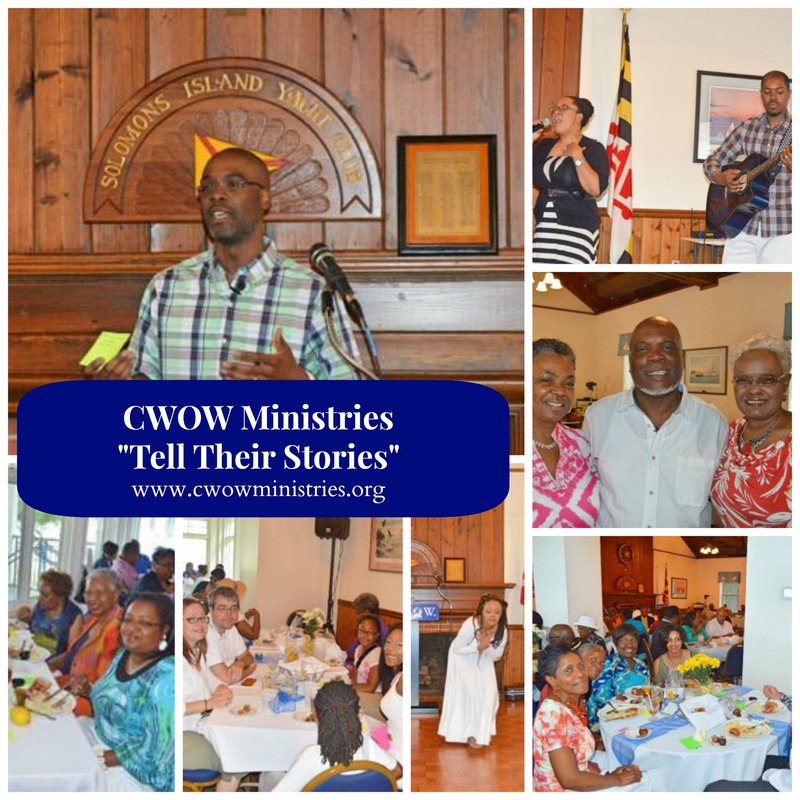 Then after dinner, we addressed the theme of our dinner, “Tell Their Stories.” In line with this theme we asked our partners and friends that they share how CWOW has impacted them personally and/or their customer(s). We also asked that they share a little bit about the person(s) helped; things like their age, gender, dreams, aspirations, and goals. “We want our partners to understand that we with their assistance are helping real people surmount real obstacles to become productive, capable, fully functioning citizens of humanity. We want our partners to see the people not the problem they are surmounting. The problem is a phase; the person is an enduring evolving being. We want to tell their stories so others might hear them and be inspired. We want to tell their stories so others will know that we are helping people who need, but want to be more.” – Dennit Goodwin, Jr.
Later the founders: Dennit Goodwin and his wife, Mary Goodwin, and their son, Dennit Goodwin Jr., shared a summary of our last 12 months in operation as an outreach ministry along with our future goals. We closed with a dance, words of inspiration, and a prayer. We are looking forward to positively impacting our community at large with the assistance and prayers of our partners and friends and we will see you next summer for our third annual partner dinner. God’s blessings! At CWOW, we see ourselves as enablers. We enable people to be the best they can be. In order to reach this goal, we must help them by mitigating, alleviating, aiding, and sometimes outright removing the hindrances and burdens that are preventing them from becoming the best they can be. We at CWOW see ourselves as cheerleaders and coaches motivating and guiding people to victory. We at CWOW are compelled by compassion to meet the needs of the many so that all may reach their pinnacle. The scripture that speaks to us this day is John 14:6 Jesus is the light, the truth and the way and no one comes to the Father except through Him. Now share with us, how can you help us convey these concepts to our partners? How has CWOW impacted your own journey? If you were at our event and you’d like to share what the event meant to you, please share. We are in the process of gathering information from our last several events and partnerships in the community. You’ll always find us on our website, CWOW Ministries, and direct here at WordPress. Check back soon as we will be publishing our event from our second annual partner dinner. Be well! We’ll share a favorite scripture with each new post. Today, the scripture that speaks to me is John 15:5. God is the Vine and we are the branches. We remain in Him and we will bear fruit because He is the center !